Cinnamon Sally Backpackers Hostel i Riga, Lettland : Boka nu! Really great hostel at a great location. The best is the staff and the atmosphere, you're included and feel at home right from when you open the door. Will stay there again. This place is just awesome! 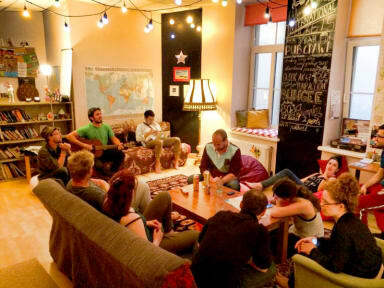 It has the true travelling feel to it, and is not just another "party hostel". However, there is never a boring time here, just a more relaxed atmosphere :) I truly suggest this place for us that are finished with tequila shots at 5am, but still like to meet fellow people and share a beer!